Dysbiosis is a term used to describe a microbial imbalance in a person’s gut, or intestinal tract. A healthy balance between good and bad bacteria is essential for proper function, and adopting a so-called dysbiosis diet has been found to have a major impact on the gut bacteria population. The consumption of low-fiber foods and excessive refined carbohydrates, processed foods, sugary foods, and starchy vegetables like potatoes can contribute to the overgrowth of bad bacteria. Alternatively, fermented probiotic foods like sauerkraut, kimchi, and kefir have been shown as beneficial for the gut flora. This article will further explain how diet impacts dysbiosis and what foods to avoid. We will also explain the dysbiosis diet plan and what other foods are best to eat. How Does Your Diet Affect Your Gut Microbiome and Cause Dysbiosis? A 2004 analysis of humans and 59 additional mammalian species found that the composition of gut bacteria differed significantly based on the species’ diet. In general, a diet low in fiber and high in fat, protein, and carbohydrates is thought to contribute to dysbiosis. In other words, the Western diet—or standard American diet (SAD)—has significant influence when it comes to gut bacteria imbalance. Those who consume this diet generally appear to have less lactic acid bacteria (Enterococci) and fewer types of yeasts than those consuming a vegetarian diet or one high in complex carbohydrates. They also tend to have more anaerobic intestinal bacteria. Therefore, it is essential to remove certain foods and factors from the diet that damage the gut, including refined oils, genetically modified organisms (GMOs), added sugar, gluten and un-sprouted grains, conventional dairy products, tap water, and synthetic food additives. You will then replace these with healing foods that help repair and rebalance the gut, such as probiotic foods; fermented vegetables; sprouted seeds; seaweed; fruit; bone broth; wild-caught fish; and omega-3-rich, grass-fed beef and lamb. A diet for dysbiosis should combine the Paleo diet and the vegan diet, along with whole, organic foods. How Does a Poor Diet Contribute to Dysbiosis? A diet high in protein, fat, sugar, and carbs and low in fiber can contribute to dysbiosis due to the slow down of bowel motility. In general, a Western diet likely does not have enough nutrients to optimally nourish the body, or to repair and maintain the digestive organs. As a result, this leads to malabsorption and a diet excessively low in B vitamins; magnesium; calcium; essential fatty acids; and antioxidants such as vitamin C, vitamin E, beta-carotene, selenium, zinc, glutathione, sulfur-containing amino acids, and coenzyme Q10 (CoQ10). This section will further explain how diets high in sulfates, protein, animal protein, and simple sugars and refined carbohydrates lead to dysbiosis. Sulfur compounds, such as sulfate and sulfite, have been found to increase the growth of harmful bacterial products in the gut. In the colon, there is a specialized group of sulfate-reducing bacteria. Some of these include desulfobacter, desulfomonas, desulfobulbus, desulfovibrio, and desulfotomaculum. These account for about 90% of all sulfate-reducing bacteria in the gut. Their purpose is to convert, or reduce, sulfate and sulfite to sulfide. But this process also leads to the creation of possibly toxic hydrogen sulfide. Hydrogen sulfide can produce excess gas and bloating as well as damage colonic mucosa through inhibiting the oxidation of butyric acid. This short-chain fatty acid is a main source of energy for intestinal cells. Sulfide has also been found to be a factor in intestinal permeability—aka leaky gut syndrome. The amount of dietary sulfate that reaches the colon is thought to be a factor in the overgrowth of bad bacteria. Sources of dietary sulfate include white bread, baked goods, packaged fruit juices, dehydrated vegetables, dried fruits, and processed foods with preservatives. At the same time, sulfur-containing amino acids found in organic eggs; grass-fed meat; and cruciferous vegetables like cabbage, cauliflower, and Brussels sprouts may also significantly increase sulfide production in the colon. The consumption of a high-protein diet can also increase the production of damaging bacterial by-products in the gut. Some experts estimate that as much as 12 grams (g) of protein daily can escape the upper GI tract and reach your colon when consuming a Western diet. The undigested protein is fermented by colonic microflora, which can result in the formation of potentially harmful metabolites such as toxic amines, sulfides, phenols, indoles, and ammonia. Amines, phenols, and indoles have been strongly associated with schizophrenia and migraines. Phenols and indoles may also function as co-carcinogens, specifically in cases of bladder and bowel cancer. Ammonia has been linked to both the reduced lifespan of mucosal cells and the neuropsychiatric disorder portal systemic encephalopathy in excess amounts. In comparison to diets high in overall protein, diets high in animal protein have a specific effect on gut bacteria. The consumption of high amounts of animal protein seems to increase activity of certain bacterial enzymes such as nitroreductase, azoreductase, 7-alpha-hydroxysteroid dehydroxylase, and beta-glucuronidase. Increased activity of these enzymes can be toxic for the bowel and even potentially carcinogenic. Research has found that diets high in simple sugars slow down bowel transit time and increase bacteria fermentation activity, as well as the concentration of bile acids, in the colon. The slower transit time may expose the system to potentially toxic substances for longer periods. The increased fermentation activity may not be due directly to changes in gut bacteria, but rather result from the colon’s direct exposure to simple sugars. This is because these sugars metabolize quickly in the colon. On the other hand, high-fiber foods ferment more gradually. Some simple sugars and refined carbs include fruit juices, brown sugar, raw sugar, and ingredients in processed foods like corn syrup, high-fructose corn syrup, fructose, glucose, and sucrose. A major component of the dysbiosis treatment is improving the diet. First, it is a good idea to remove potential food allergies, sensitivities, or intolerances from the diet. You can help determine food allergies with a food elimination diet or an enzyme-linked immunosorbent assay (ELISA). You can detect energetic food imbalances and sensitivities in the body with tests like a bio-meridian test, bio-analysis with bio-energetic testing, and a meridian stress assessment test. That being said, diets for dysbiosis will contain some common characteristics. 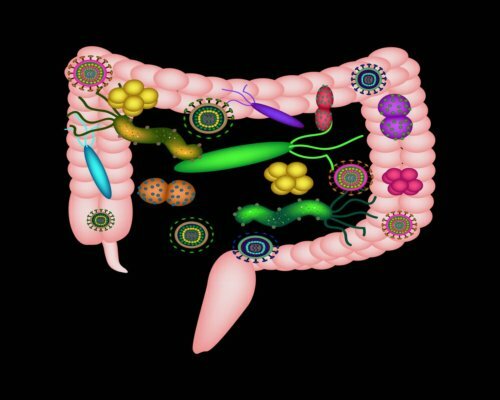 The nutrients most likely to be lacking to maintain and repair the digestive organs include the B-complex vitamins, essential fatty acids, magnesium, calcium, vitamins C and E, zinc, beta-carotene, selenium, coenzyme Q10 (CoQ10), and the sulfur amino acids. Overall, the dysbiosis diet plan will contain certain foods while removing others from the diet. Dysbiosis Foods to Eat: The following foods can be listed in the “safe to eat” category unless you are sensitive or allergic to them. Probiotic foods like kefir, sauerkraut, kimchi, kombucha, natto, and miso. Dysbiosis Foods to Avoid: It’s important to avoid these foods at all costs when you suffer from dysbiosis. Your diet has a major impact on your gut bacteria and GI tract, and can cause dysbiosis. A standard American diet high in fat, overall protein, animal protein, sulfates, simple sugars, and refined carbs, and low in fiber can lead to a harmful imbalance of good and bad bacteria in the gut. It is a good idea to avoid a typical Western diet, which includes processed foods, starchy vegetables like potatoes, wheat and other gluten grains, dairy products, sweeteners, and foods with mold like mushrooms or leftovers. These items contribute to the overgrowth of bad bacteria and yeasts, whose metabolites may contribute to chronic health conditions. Instead, your diet should include fermented vegetables and other probiotic foods, wild-caught fish, organic and grass-fed meats, and green leafy vegetables. These foods will work to boost the population of good bacteria in your gut. Work with a natural health practitioner like a holistic nutritionist or naturopathic doctor. They will be able to create a specialized dysbiosis diet plan that is right for you. Lipski, E., Digestive Wellness: Strengthen the Immune System and Prevent Disease Through Healthy Digestion (New York: McGraw Hill, 2012), 74. Hawrelak, J., “The Causes of Intestinal Dysbiosis: A Review,” Intestinal Dysbiosis; http://altmedrev.com/archive/publications/9/2/180.pdf, last accessed May 18, 2018.